For all CDN services we provide detailed raw access logs downloadable via FTP, FTPS, SFTP and RSYNC. To enable raw logs you need to create a raw logs service and for that you need a CDN service and a logs storage. Please refer to CDN Static, CDN Video or CDN Live for more details on how to create a CDN service. Please refer to Creating, accessing and upgrading a logs storage for more details. 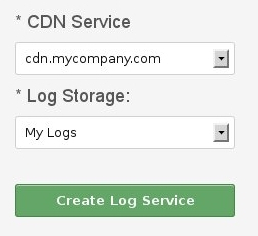 To create a raw logs service please visit the Reports/Logs page and fill in your desired CDN service and a logs storage as in the picture below. You can set a keep days parameter of your logs services. By default it is set to 31 days and it means that the service will keep your logs for the last 31 days. When it is set to 0 then the logs service will use all available logs storage space and then it will rotate your logs within this available space. The format for static CDN services (CDN Static and CDN Static Push) is the Combined Log Format. 1.2.3.4 - - [10/Oct/2000:13:55:36 -0700] "GET /image.jpeg HTTP/1.1" 200 2326 "http://http-referer.com/" "Mozilla/5.0 (Windows NT 6.1; WOW64; rv:32.0) Gecko/20100101 Firefox/32.0"
The format for streaming CDN services (CDN Video, CDN Video Push and CDN Live) is the following. Logs are collected every hour. The string W2 at the beginning and at the end of logs of streaming CDN services stands for the format version. Logs of streaming CDN services are generated for their Service Identifiers, e.g. 12345.r.cdnsun.net (even if you access your CDN services via Service Domains, e.g. live.mycompany.com).